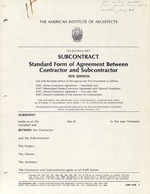 A201, General Conditions of the Contract for Construction. and the Associated Specialty Contractors, Inc. The Contractor and Subcontractor agree as set forth below. without permission of the AIA violates the copyright laws of the United States and will be subject to legal prosecution. contract, and are as fully a part of the Subcontract as if attached to this Agreement or repeated herein. 3.2 Time is of the essence of this Subcontract. tractor in accordance with Paragraph 11.10.
be submitted to the Conractor on or before the day of each month. or corrected by the Subcontractor. Subcontractor's Work have been satisfied. required of the Contractor by the Contract Documents. ment, this Agreement shall govern. without written notice to the Contractor. conflict or interference with the work of others. the Subcontractor's employees at the site. rubbish arising out of the operations of this Subcontract. Article 5 to enable the Contractor to apply for payment. shall submit a statement based upon this schedule. to satisfy the requirements of the Contract Documents. son described in this Paragraph 11.11.
of the injury or damage. costs of shutdown, delay and start-up. schedule and the additional scheduling details. the aggregate of previous payments to the Subcontractor. account of Work done by the Subcontractor. 12.4.1 or the final payment as provided in Article 6.
following that in which the claim originated. cordance with the Contract Documents. entity is not the Architect, his employee or his consultant. applicable law in any court having jurisdiction thereof. such rights or remedies are expressly waived by him. able overhead, profit and damages. This Agreement entered into as of the day and year first written above. and General Conditions (AIA Doc. A401). the Historic St. Augustine Preservation Board. cates shall be notarized affirming that all supplies, labor, etc. be furnished by the Contractor. 9.3 Subcontractors shall obtain all of the following types of insurance. amended to provide coverage on an occurrence basis. Policy shall cover such contracts when they are affected. which form a part of the Contract Documents. Form, with all risk endorsement. as specified in Section 1C.